You may have run into this yummy truffle recipe however it escaped my attention until I was introduced to it at a party just recently. It was so delicious that my iron will in regards to sweet temptations broke down and I indulged in several. But, I wondered what made them so good because when I asked the gal who had brought them, she said that they were deceivingly easy to make and even kids with parental help could make them. So lo and behold, I found the recipe on the net and true enough, they are a breeze to make. You all know how I love to share good things so here is this breeze to make recipe. I thought that one could actually form the shapes to look more like chocolate Easter eggs— give that a try—and enjoy. One 8 oz. package of Philadelphia Cream Cheese, softened or one 8 oz. carton of softened Cream Cheese. Two 8 oz. packages Bakers Semi-Sweet Chocolate, melted. Kraft suggests placing the unwrapped chocolate in a microwaveable bowl and to microwave on high 2 ½ minutes or until chocolate is completely melted, stirring every 30 seconds. For myself, I place the opened chocolate in a microwave bowl, put about 2 ¼ Tsp. of unsalted butter on top and micro on medium for about 2 minutes, then stir and continue microwaving on medium for 30 to 60 seconds more stirring intermittently until chocolate and butter are all melted. Sometimes I omit the butter. If you are into professional looking exteriors, you probably should temper the chocolate which takes a bit of patience and time. For tempering instructions, look that up on the net or a good cookbook. Crush 9 of the cookies to fine crumbs in food processor(about 1/4 C.); reserve this for later use. You can also crush the cookies in a plastic bag using a rolling pin. Crush the remaining 36 cookies to fine crumbs and place in a medium bowl. Add cream cheese and mix until well blended. I used my hands. Roll cookie mixture in 40 balls or if for Easter, into egg shapes. They should be about one inch in diameter to give you a general idea of the appropriate size. 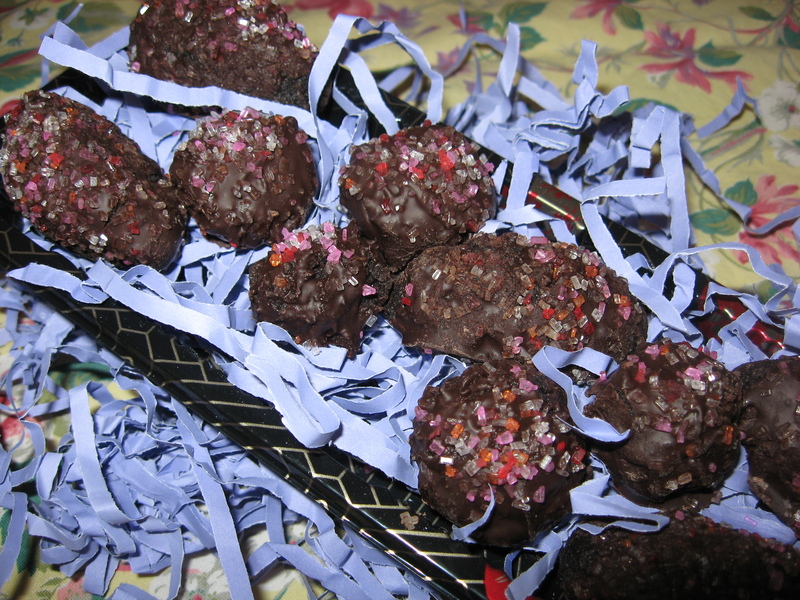 Dip balls/eggs in the melted chocolate; place on a wax or parchment papered baking sheet. To easily coat the truffles with the melted chocolate, add truffles, in batches, to bowl of melted chocolate. Use 2 forks to roll the truffles in the chocolate until evenly coated. Remove the truffles with the forks letting any excess chocolate drip back in the bowl. Place truffles on your papered prepared baking sheet. If you have any left-over chocolate, store that in the frig. for some other later use. Sprinkle the balls with the reserved crumbs if you wish. I have frozen these and they turn out just fine. In fact, I eat them straight out of the freezer and they are delicious. I also have put some crushed lavender culinary buds in the cream cheese and that has turned out well. I dare you not to eat them all immediately. However, if you are that strong of will and constitution, store in a tightly covered contained in the frig. for a later serving. Don’t plan on any left-over’s.